I make this just about every week. It is something that is nutritious, cheap, and easy. Since we've started our Real Food Journey, people will ask me, “How do you afford eating like that all the time," and to that I say, there are a lot of real food options that are super cheap that should be staples in your weekly rotation. (This recipe and pinto beans are two of my faves. Both cheap, whole, real foods.) Also, I do not buy organic cabbage because it is on the clean 15 list, so it only costs a few dollars. (click here to read the dirty dozen and clean 15). So, let me tell you a little bit about cabbage… and why it should be at the top of your grocery list every week. 2. In a mixing bowl, stir Mayonnaise, Apple Cider vinegar, and cane sugar. 4. Chop up the cilantro. This is, I think, what makes it SO good. Cilantro is a staple in our home. 5. Dump the cabbage in the bowl along with the cilantro and almonds and stir. (it will probably work better if you use your hands). We like to put this on top of some leafy salad (no dressing needed) or just eat alone. I eat a fat bowl of it almost every day. I realize that this recipe has sugar… which we all know is not the greatest for you. But you will find out quickly I'm all about real food tasting good. (i.e. Brussels Sprouts with Bacon). If what you're cooking is super nutritious but no ones is going to touch it, then it kind of defeats the point. So if that means adding a little real maple syrup to our veggies (its actually really high in vitamins), a lot of butter or some bacon to our dishes, I say go for it. We are also on a journey to better health...and it's beginning with lots and lots of whole foods! 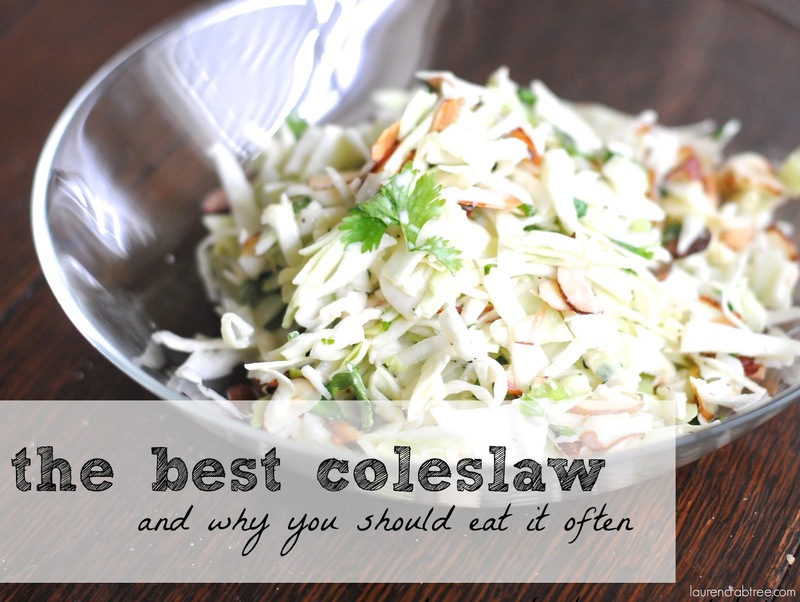 I know my hubs will love this coleslaw recipe - thanks for sharing! that is awesome! Yes, this is a favorite of my hubs (and he's kind of hard to please...) Thanks for reading! This looks so delicious!!! I've never bought cabbage before, I don't think ever. But now i want to! Sounds delicious, I love cilantro too but would've never thought about putting it in coleslaw. Thanks for the recipe and sharing about your real food journey. So encouraging! Hi Lauren, I stumbled onto your blog not too long ago and have really enjoyed reading. Also, I just made this coleslaw, and it was great! I forgot to add the sugar but loved it without. Thanks for posting. we do a slaw similar to this! looks yummy! we made vegan coleslaw last month with red cabbage. It was pretty yummy. Your recipe with almonds looks delish. does vegan coleslaw mean it just doesn't have mayo in it? Thanks, Sarah! Yes, I somehow find a way to put cilantro in just about everything (its really good for ya!) Thanks for stopping by! yes, I never bought it either, until recently! Cheap and healthy! I made this last night and it was a hit in my house! My 20 month old really enjoyed feeding it to himself :) I added some salt and pepper at the end to make it a little more savory. I've been buying cabbage more & more recently, since it's so healthy, as you mention, and inexpensive. It's also really great roasted in big slices, drizzled with olive oil & sprinkled with salt & pepper! The edges get brown & caramelized--yum. update: we ate the leftovers on top of slow-cooker pork adobo tacos with corn tortillas....SO good. my mom--whom we have over for Sunday dinner--raved about the slaw and my partner Jill, who doesn't normally like colelsaw, said it was the best she'd ever had. you definitely have a winner here, girl!